Fixed oaken pews facing tword a curtained back drop stage. Four chorus’ a sermon and an invitation. A pulpit front and center with a preacher proclaiming his sermon. Powerpoint slides, with ballet slippers as a background, expounding songs about “falling in love with Jesus” or “dancing with Jesus” shown on a wall above the band. The baptistry, long since dry, waiting with hope as the parishioners exit the doors of the fellowship, passing by a sign that reads “You are now entering your mission field”. Church. For many these are the images of Church. Sadly these were my pictures of what Church was. But what if it was so much more? 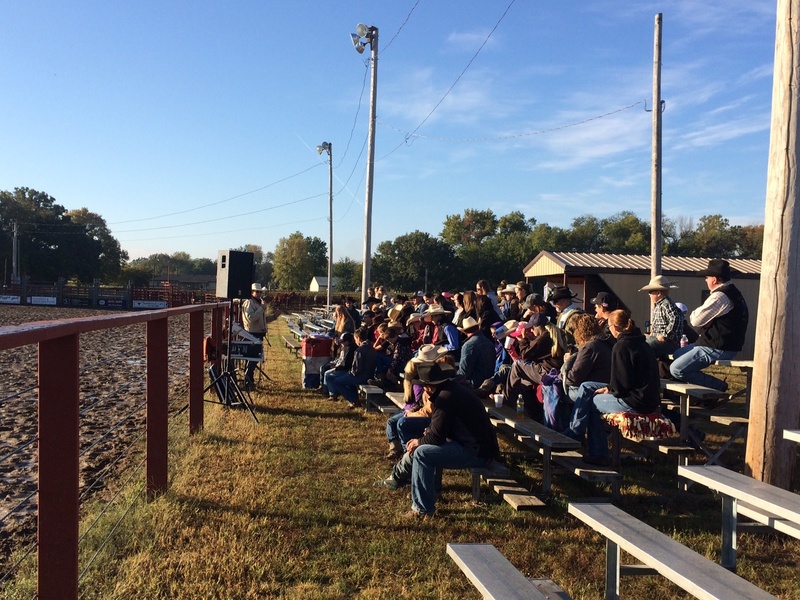 What if Church was songs sung as the sun rises over a damp arena, worship around a campfire, a conversation at the sale barn, or a late night of team roping? What if Church has become to narrowly defined? As he writes the book of Acts, Luke the Historian, breaks from recording stories and sermons, to take a birds eye view of what is happening with the Church. Acts 2.24-47, the first of his overviews, is the result of Peter’s sermon at Pentecost. The Church is getting its bearings, in its infancy, and Luke records its key components: teaching, fellowship, worship, and prayer. Its people shared with each other as they had neeed, taking care of one another, and they praised God. God kept adding to their number every day. Acts 4.32-35. The Church has grown in size and influence. They are testifying to the resurrection and are growing together in their doctrine. They are taking care of one another, providing for each other’s need, and grace is being poured out amongst themselves. Acts 5.12-16. God’s power over sickness and evil is being shown amongst the people. As they are meeting together, God is working through them in each others lives the result of which is more and more people being added to their number. Acts 6.1-7. The numbers have grown so much that the daily task of taking care of people has become too much for the apostles. They picked seven men to take on the task of serving the people, so that the apostles can focus on prayer and teaching. The word of God spread and their numbers grew rapidly. Acts 11.19-29. The Church in Antioch gets it beginnings. A great number of people came to the Lord and a multi-cultural Church grew to be the launching point for missionaries. The Church at Antioch was the leading church in the area, quite possibly the world, and it all started here. So what are these asides, parenthetical notations, footnotes about the early church supposed to teach us? Why is Luke filling in the book with these organizational details? It’s a Community…we are God’s people. We are unified, devoted to one another, and connected. The early Church took care of one another. They fed eachother, took care of one another, and loved each other. When one joined the Way, they often were kicked out of the synagogue after a while, lost their meal ticket, and were sometimes abandoned by their friends, families, and bosses. The only way to survive was to depend on your fellow Christians. What would it look like if we took care of one another the same way today? …Following Christ…the thing that tied it all together was the Name of Jesus Christ. It was the resurrection that changed these people. Suddenly it was sunday that they were worshipping on (Acts 20.7) and they were devoted to this teaching by the Apostles (Acts 2.32,42). Christ’s call on their lives was the thing that they all had in common. How would this change the way we orient service and worship? Challenge. The Challenge of Christ was to love the people around them. To serve and take care of the people they came in contact with, whether it was in the market as they passed by (Acts 2), those that they came to from a distance (Acts 11), or those that they would travel across the ocean to sea. Christ’s challenge to them was to take care of them, to love them as he did, and to serve them as he did. When is the last time we asked ourselves, who it was that God had brought into our life to serve and love? My church experience would change if I honestly asked that question.